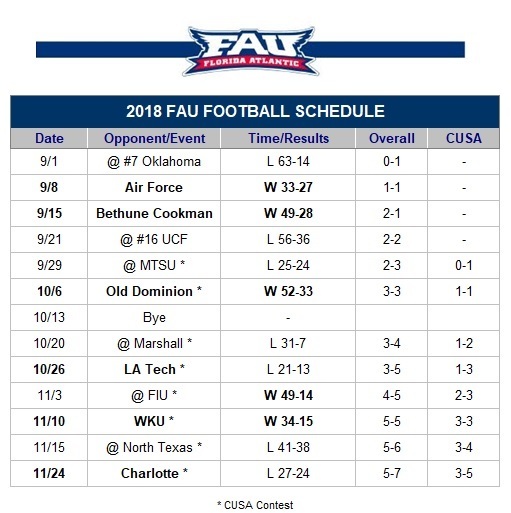 Here's the FULL 2018 FAU Football Schedule for your weekend calendar & travel arrangement planning! WOW! #UCF fans - you want College GameDay in Orlando? @FAU_Football AT @UCF_Football on Saturday, September 22nd. What is up with CUSA and scheduling vs. the opposite division - same 2 teams as last year? Not to even try to rotate so everyone faces everyone else over a few years time??? FAU last face S. Miss in 2013 at their place and we have NEVER hosted them yet! I do see we at lest swapped sites so La. Tech here at least - so Air Force and La. Tech new to FAU stadium and fans! QUITE STYLES OF DIFFERENT TEAMS THEY ARE TOO! Bye before Marshall a good thing too! We could easily be 2-2 in OOC games. And the stretch from Marshal through UNT is going to be tough - with 3 of those on the road. Everybody in C-USA is going to be gunning for us, too. I know a lot of posters think we will just easily roll through the conference schedule, but I predict double-digit wins is going to be a tall order for 2018. I truly hope we roll again, but it is always harder to repeat a great season. Regardless, I will target attending all home games, the UCF game, and try to possibly make FIU. And I will pull hard for 14-0 with a New Year's bowl win! We could be in a top 25 match up on opening weekend if the polls roll our way…..good to see expectations skyrocketing for our boys….. So we obviously have a few changes to the schedule that occurred today. FAU will open the season on FOX, against Oklahoma at Noon Eastern. This is the first time in program history FAU will play on one of the major television networks. It's finally happening! For the first time in program history, #FAU Football will be on FOX for a nationally televised game against Oklahoma. Kickoff is set for Noon Eastern, 11 AM Central. Moreover, CBS Sports Network picked up and changed the dates for a pair of FAU games. FAU's home game vs. LaTech has moved to Friday, 10/26. Kickoff at 6:30. FAU's road game at UNT has moved to Thursday, 11/15. Kickoff at 9:30. SIDE NOTE: The C-USA Championship Game will no longer be on the ESPN Networks. The game will be on Saturday, 12/1, also on CBSSN. Yeah, I mean realistically, can we expect to go undefeated in the conference again? Just want to make sure expectations are realistic because that is a difficult thing to do one year, let alone two - no matter how good you are. Teams will be gunning for us now and we have some tough games. With that being said, when looking at the schedule, we are certainly the favorites to win the conference again. At worst I am seeing 8-4 overall, although it is somewhat realistic to think we have a repeat 9-3 regular season record, and an 11-2 record is a possibility as well. Just want to be realistic with repeat expectations because I am not sure how much better we can be – last 10 games last year was as good a ride as I could possibly have imagined.